The other day, as the warm weather shrunk the snowbanks into the ground, I worked in my yard. If you recall, we had our cottonwoods trimmed last fall and under the snow is a carpet of sawdust and sticks. It’s going to take a few sore backs full to clean up this mess. As I stretched and straightened, I looked up at something Not Quite Right. There was a cow. A cow where there shouldn’t have been a cow. Brandon’s little herd has been penned in a corral across the highway… He’d had four babies but there were 25 left to go! Those old hides were escaping!!! I jumped in the Rhino and went to investigate. They were lining out, heading down the trail, going Somewhere. I left the Rhino and ducked through the fence thinking I could turn them. A short footrace quickly proved to me that is was a poor choice, and I headed back to the Rhino. I had to take a short sidetrip and dump my garbage I’d filled it with, then I was going to go get my cowdogs to help me with this job. A zip of half mile or so, plus the time to open and shut the gate, and my cowdogs met me! There was Action and they weren’t about to be left behind. We quickly caught up to the bunch and I turned Lucas on them. He’s not a barker and there were two momma cows and calves. Well… Dally, and then Eden, were not to be left behind and the cows definitely were turned around by the three dogs! 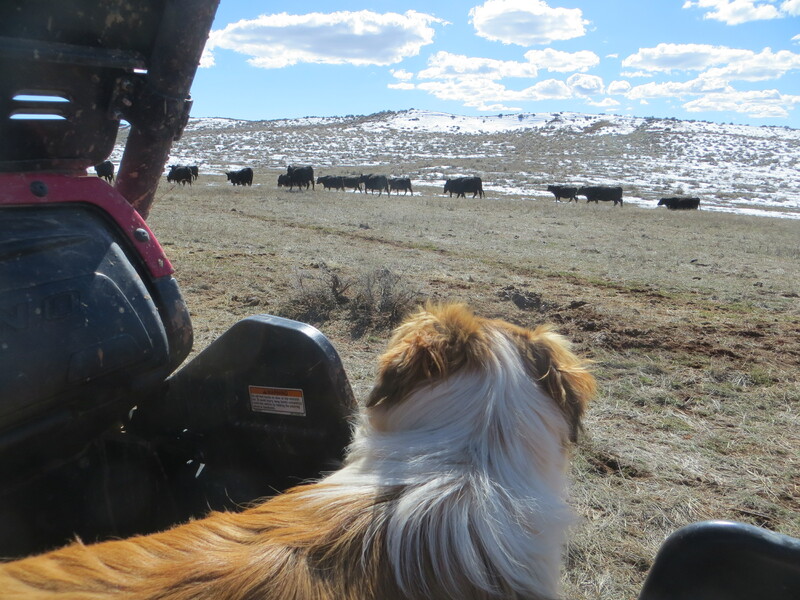 I loaded up my workers and we began to follow… at a bit slower pace than my excited, spring-filled pups would have done. Eden thought it was grand. The cows were cooperative and lined out back into their corral with a minimum of fuss. As I approached the gate however… something else wasn’t quite right. The gate was full open, dragged back onto the fenceline like it was *supposed* to be open. Cows don’t usually open gates quite that well. I shut them in anyway, then drove over to Brandon’s house. Megan WAS home, although I thought she had gone to town. Huh. Oh well. The dogs and I drove back over and opened the gate wide again. Sometimes it’s best just to mind your own business! I smile! Ranch life teaches you to take action, NOW and ask questions later…….looks like you have that one down pat! And no GUYS involved. Looks like a win, win situation to me. Hopefully they will remember to send you the ‘memo’ next time they move the cows. The dogs worked well . Lovely picture of Eden checking on progress.